All transactions are safe and secure with a reliable history in online purchasing behind each of our associates. 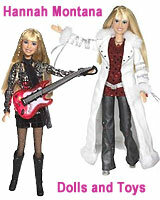 Buy the Hannah Montana Dolls and Toys to own Hannah Montana clothing and merchandise. Embody the best of both worlds with a Hannah Montana singing doll and a Miley Stewart doll. Each stylish figure comes with accessories like microphones and microphone stands, brushes, purses, bracelets and backstage passes. Give a pass to the Oliver figure so that he can come congratulate Hannah after her concert. The singing dolls perform hits like "True Friend", "Nobody's Perfect", "Rockin' Around the Christmas Tree", "Pumping Up the Party" and other notable favorites. In addition to the Hannah Montana Dolls and Toys above, browse the Hannah Montana Clothing Gallery for more apparel like men's and women's clothes, kids shirts or hoodies.